Another sorrow filled day for the Kain family. It should be a day of crazy celebrations because it's our first born, Everett's birthday. We never celebrated a birthday with Everett because he passed away from an extremely rare heart defect when he was only 6 months and 9 days old. Everett's birth defect was explained as a 1 in 10 million births in the United States. He bounced around hospitals before we found a leading cardiologist at Children's Memorial Hospital in Chicago. The doctor performed two heart surgeries and was hopeful that he would be able to save Everett, but his surgeries couldn't correct the defect. Everett spent approximately half of his short life in hospitals. Lisa and I have seen and been through more than any two people should ever endure and be expected to survive. I'm sure some people wonder how we do it and I don't have an answer, I guess we're just adapted to endure. Through everything, nothing compares to watching Everett slowly earn his angel wings as Lisa held him for days as we knew there was nothing left for the doctors to do. We had hoped to donate his organs so other babies could benefit with parts of Everett living on, especially his big beautiful blue eyes, but he was too weak at the end to donate. Kellisa and Kirsten's complications are not related to Everett's and the girls are their own and separate 1 in many millions. Before adopting, we consulted with a doctor to learn the odds of a third pregnancy being completely successful. Since both of Lisa's pregnancies were unrelated and neither were hereditary, we were told that any future pregnancies had the same odds as any other healthy couple our age. The doctor wanted to place odds of two 1 in millions pregnancies happening to the same couple, but he couldn't come up with a number high enough, he left it at incomprehensible. I think the doctor could tell that we weren't really comforted by his information and green light to proceed, so he offered another fact. He told us that if Everett would have been born in 2007, doctors would now be able to perform successful surgery on his heart leading to a long and healthy life. Again, this did not comfort us and was devastating before we realized through hopeful reflection that Everett may have helped future babies with his heart defect survive by the experiences of his two surgeries. We like to think he continues to save 1 out of every 10 million babies born in the United States with the same heart defect. 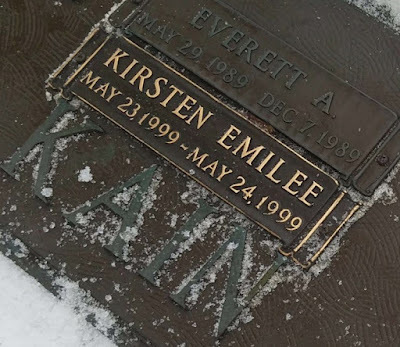 We purchased two gravesites after Everett passed away with the plan that he would spend eternity over Lisa. We had no idea that in less than 10 years, Kirsten would be spending eternity above me and next to Everett and Lisa. About 10 years ago, we purchased the site directly before my spot for Kellisa.